Manila, Philippines - Bernice Lee, the sister of businessman Cedric Lee, was arrested by the National Bureau of Investigation (NBI) agents today, April 21, 2014 in her residence for the grave coercion case filed by mauled actor Vhong Navarro. 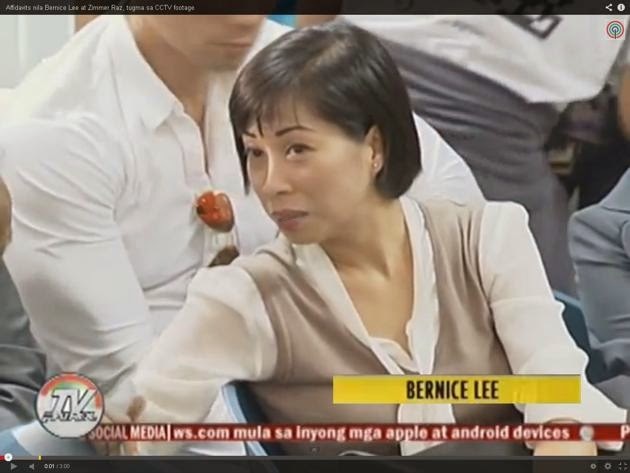 Reports said that Bernice Lee was arrested by NBI around 7 p.m. in her West Green Hills residence in San Juan. The warrant of arrest was issued by Judge Esperanza Cortez. Lee was then brought to the NBI-NCR headquarters, where she underwent booking procedure and medical test. The court earlier placed P12,000 bail for her temporary freedom but she has not posted bail and since the courts are already closed, she will have to spend the night in jail. The NBI agents on Monday night also went to one of the known addresses of Cedric Lee but failed to arrest him. Earlier, warrant of arrest had been issued by Judge Cortez versus Cedric Lee, Deniece Cornejo, Jed Fernandez, Simeon Raz and Ferdinand Guerrero. JP Calma is allegedly fled the country. Lee is also one of the seven accused in the serious illegal detention case, a non-bailable offense, but the judge did not include her in the arrest order.